These were the tips given by the habal-habal driver I chartered for touring the waterfalls within the tourism triangle of Iligan City before we arrive in the jump-off point to Tinago Falls. The woman in-charge assigned two locals who will be joining me on the trek to the falls. I insisted for just one since I will not be spending a lot of time there but the local teens said that they will just split whatever amount I will be giving. Everyone is required to register in the log book on the next house. The other lady asked if I will be renting a life vest and suggested that I should also try the raft ride to the falls. “Php 35 for the vest and the raft fee”, she muttered. She also solicited me to drop some donations on a box. We continued the trail to the falls and I noticed some ruined houses. One of my guides said that it was once a resort but was closed due to bankruptcy. We also passed by the accommodation’s swimming pool which is now the leisure place for some insects. Afterwards, we started descending the steep and slippery steps going down to the falls. Gush of the cascading waterfall can already be heard halfway. 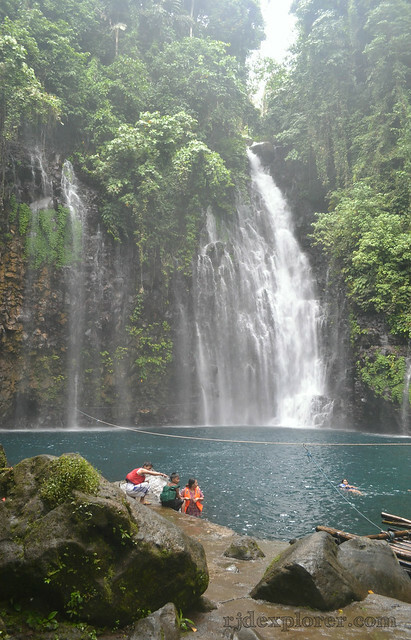 The waterfall was named as Tinago with its literal translation, “hidden”. 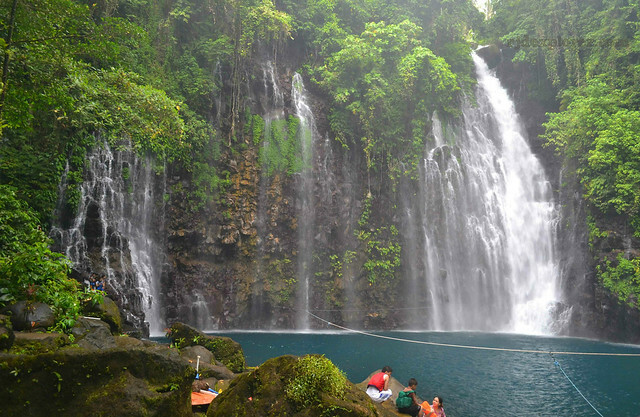 But as you approach the main viewing area, the apparent magnificence of Tinago Falls will simply meet you. I can’t believe my eyes; the wall of rocks was splattered by an immeasurable number of water flows and thriving vegetation. The water pours directly into the basin where you can enjoy the revitalizing, cool, and blue-green water. Taking a photo of Tinago Falls was a bit challenging because spray of water being blown away from the falls easily covers the lens of my camera. The guide handed me the vest and informed me that we will be riding the raft to the falls. I suggest you’d be more careful when walking on the cemented parts of the viewing area since it is really slippery. 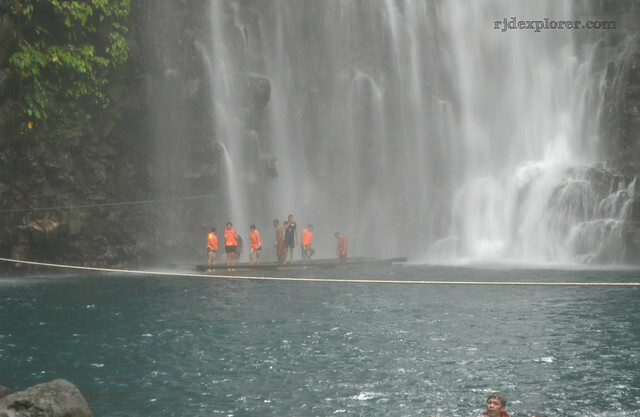 Raft going to the cascading falls is sturdier compared to the raft being used in Pagsanjan Falls. Your guide will be the one to pull the raft using a rope entwined at the base of the rock wall. The falls you see from afar which has a smooth, feathery flow of water was really harsh underneath. The gush of water on your body was relaxing though. It was too cold that my legs had cramps during the activity. Our group also tried pulling the raft towards the small cave. After almost an hour, I have decided to leave. The catch of visiting a great waterfall is the anguish you need to endure in getting back to the starting point. I was grasping my breath for each step and habitually request for a short rest. Gone are the days that Iligan City is being visited because of the famous photo of Maria Cristina Falls found on our elementary textbooks. Because as of the moment, Tinago Falls is now being considered as the major attraction of the City of Majestic Waterfalls. 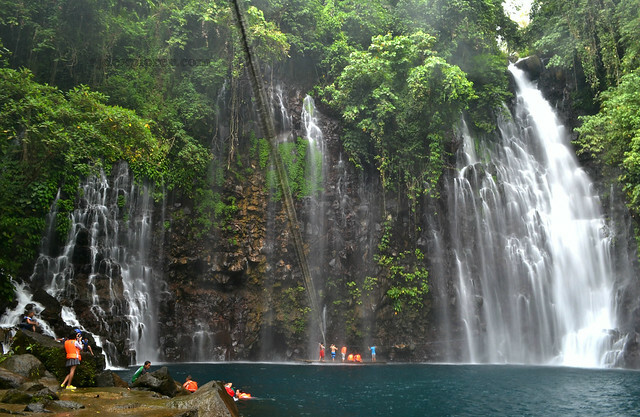 I quite agree, Tinago Falls is now stealing more of the limelight of Iligan sights over Maria Cristina Falls. I first saw this waterfall when it was featured in Forever and a Day 2011 Filipino film and it was true sight to behold. How much steps into the ravine?